When you're at the top, there's nowhere to go but down. Two talented skaters. Two bright futures. Two shining stars. One ruined by a career-ending scandal and another by a father's ruthless ambition. Marina Sanders was the darling of the winter games, winning a bronze in figure skating one week after losing both parents in a car accident. Four years later, she was the most hated woman in America. Drew Delacorte was the future of the Sockeyes hockey team, crowned the best young player in the league and heir-apparent to the hockey throne once occupied by his father. Only Drew doesn't want that throne. Despite being in the prime of his career, he's considering hanging up his skates. Together they're fire and ice, and when things get that hot, they melt. Can these two broken souls find comfort and courage in each other's arms or will they find only pain and regret? Marina and Drew were truly like fire and ice. Going from one extreme to the next while they tried avoid the inevitable. The story was full of emotion, passion, self-discovery, setting boundaries, and family. I enjoyed watching their relationship grow and change as well as watching them both find their own confidence in their decisions. A great addition to the series! Wow what a book. 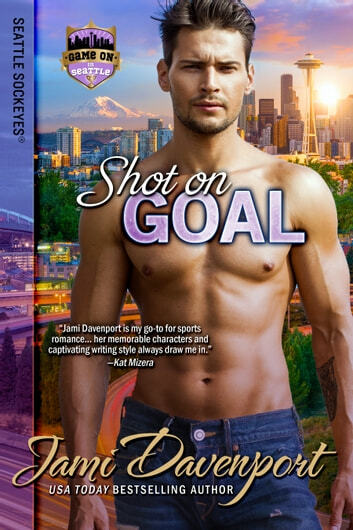 I have read all of this authors sports Romance books and this is absolutely my favorite. It has the right amount of actions, drama and romance. The characters are superb. I sense spin off series from this book. If I remember right the PI business was mentioned previously. Jami has an incredible skill when it comes to intertwining characters of different backgrounds and different phases in life. The characters Drew and Marina are beautiful characters looking for a direction in which to follow. Jami’s style of writing makes you see and feel these characters. Jami Davenport lights the lamp with SHOT ON GOAL, the eleventh book in the Game On in Seattle series. Hockey star Drew Delacorte and former Olympic figure skater Marina Sanders are broken souls. This is their story about what caused their troubles and what is in store for their future. This contemporary sports romance is suitable for adult audiences. I adore Drew and Marina. They have a complicated past. They are both broken and get what the other is going through. They are both very human. They have made mistakes and must live with the consequences. I appreciated that Marina was given an opportunity with the Sockeyes. She is a tough individual with a lot of talent. Drew and his parents are living with the ghost of Drew’s dead brother David. Drew is being smothered by his parents and no longer enjoys life until Marina makes him smile again. I like that the story was realistic. The characters face a lot of difficult decisions and make hard choices. Things don’t always turn out how they want. This novel is an excellent example of how one mistake can impact your life. Unexpected things happen. I like how the story was resolved. Furthermore, I love that the Sockeye’s make it to the Stanley Cup Finals. There are some great hockey scenes. I voluntarily reviewed an advance reader copy of this book. I received a review copy of the book before release for an honest review. This book was simply amazing. I have read this entire series, this is book 10 in the series but it stands alone. That said it brings all our favorite characters back as the Sockeyes are eyeing the Stanley Cup. If you have read this series then you know what a big deal that it is. This story features Marina who is an ice skater who failed at the gold and did it in a terribly humiliating way so much so that the American public hates her. Drew is one of the best skaters on the Sock Eyes but between a controlling dad and a lot of guilt about his deceased brother her has lost his love of the game. The problem is the team needs Drew to win the cup and that is where Marina comes in. She has been hired to teach the players figure ice skating moves. This was a hockey intense story as we watch the team head to the finals. Meaning if you don't want to read about hockey you will get a little bored. I loved how we also get to see the figure skating aspect and how it relates to hockey. Marina and Drew are in heavy lust but their romance is very forbidden as she is one of his coaches and her past mistakes. But I loved how despite a relationship causing trouble the Drew decides he wants her and he goes all in. But Marina is afraid and she needs to learn to take the risk for love. I loved this book so much and I loved the ending so much. I love how the series comes full circle in this story and kudos to the author for a wonderful story to end it all.